International CyberFair, now in its 24th year, is an award-winning, authentic learning program used by schools and youth organizations around the world. Students conduct research about their local communities and use digital media to publish their findings online. Recognition is given to the best projects in each of eight categories: local leaders, businesses, community organizations, historical landmarks, environment, music, art, and local specialties. This White House endorsed program encourages youth to become ambassadors for their own local communities by working collaboratively with community members and using technology tools to publish a website or create a video that displays what they have learned. The annual contest has involved more than 5.5 million students from 50,000 schools across 115 countriesand is considered the longest running international online event of its kind. The purpose of International CyberFair is for youth, their schools, and their local communities to use digital media to share resources, establish partnerships, and work together to accomplish common goals. We believe that involving youth in educational outreach projects will foster worldwide friendships and unite communities. The Global Community - We are linked to the world! Every nation wants their children to learn the skills they need to succeed both in the world of today and in all the tomorrows that follow. We want safe and strong communities in which citizens can live and learn together. We want our youth to be responsible "global citizens" who appreciate and respect the diversity of the world around them. Communication technologies can foster positive and productive interaction among local and distant groups. Youth participating in International CyberFair learn what it means to be part of a community... both locally and globally. They work with groups of young people located around the world, each group showcasing their local community online. Youth act as "Student Ambassadors," working with local leaders, local artists, local business, and the rest of their community to show the world what is special about *their* place. As examples, youth can meet local artists and musicians, interview them, tape their music, photograph their art, and show the world their cultural heritage. Or, youth can work with their local chamber of commerce, farmers, or local business leaders, to show the world the things they make, grow and build. 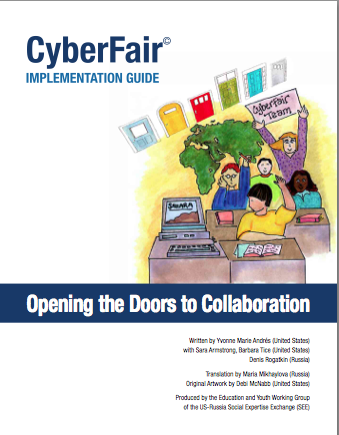 The focus of International CyberFair is collaboration -- first at the local level and then on an international level. To encourage teamwork each school or organization may submit only one entry. Therefore, part of the learning experience is building consensus in choosing an entry topic. Register for CyberFair as soon as possible to receive important announcements. Once registered, you may update your information at any time until the final project deadline. Stories about students engaged in positive learning projects are always newsworthy. Don't miss this opportunity to seek favorable publicity for your school or organization in your local community. To help you get started, we have provided you with some media-friendly strategies and templates. Learn more. Companies, organizations, and individuals who support the International CyberFair program believe that young people can make a difference in the world! Over the past two decades years many companies have contributed prizes, services and funding support. CyberFair supporters include Adobe, AOL-Timer Warner Foundation, AlphaSmart, Apple, Canon, Cisco, Cisco Foundation, Cu-SeeMe Networks, Epson, Gateway, GTE, Hyperstudio, Impatica, Lexmark, Lightspan, Macromedia, MCI, MCI Foundation, Microsoft, Microsoft Taiwan, NeTV, Network Solutions, Tech4Learning, Wells Fargo Foundation, and the San Diego Union-Tribune. The importance of CyberFair has been acknowledged by Presidents, senators, congressmen, and ministers of education from many countries. For example, President George W. Bush, President Clinton, Vice President Al Gore, Secretary of State Colin Powell, Condoleezza Rice, Susan Golding (San Diego Mayor), Max Gail (actor), Ronnie Lott (football superstar) Sinbad (comedian/actor) and Business leaders - Vint Cerf, Steve Wolff, John Morgridge are a few of the notable people who have applauded CyberFair.